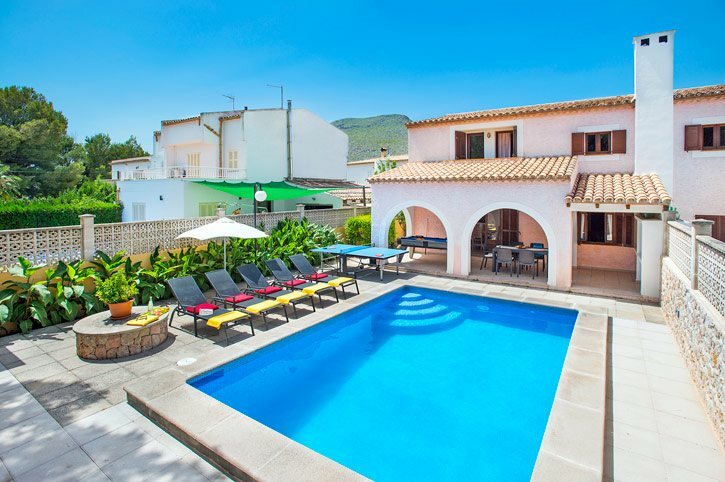 Villa Monsy I (foremerly known as VillaTopacio) is in a great position, only a few minutes' drive, or 15 minutes' walk from Puerto Pollensa Beach. A choice of shops and restaurants are within a 5 minute walk, with a much larger choice in the centre. Plus, Pollensa Old Town and the lively resort of Alcudia, as well as a number of attractions and alternative beaches, are also within easy reach. The villa has a private swimming pool, a bright and airy interior, and includes air conditioning/heating in all 3 bedrooms, plus WiFi. The beach and facilities of one of Majorca's most popular resorts are within easy reach. The ideal base for your villa holiday. A covered terrace with 3 arches provides shade for the alfresco dining area and overlooks the private swimming pool. The terrace has ample space to enjoy a game of pool or table tennis. The brick BBQ is to one side of the swimming pool, whilst at the far end is a raised sunbathing area. There is also a gate, shared with Villa Monsy II next door, which opens onto the lane leading into the resort centre. Villa Monsy I is semi-detached with our Villa Monsy II, and both villas share a parking area. A path from here leads to the man entrance into the house. The open plan living space has a sunken lounge, with seating, a flat screen TV and an ornamental fireplace, as well as a dining area with a table and chairs, and a WC. Patio doors open onto the dining terrace and swimming pool. The adjoining kitchen is fully equipped, and has a small breakfast table, plus access to the utility room. All 3 bedrooms are on the first floor of the villa. There is a double bedroom, a twin bedroom and a single bedroom which all share a separate bathroom on the opposite side of the hall. The double and twin bedrooms share a small balcony overlooking the swimming pool. Located in the area known as Siller, just outside Puerto Pollensa, Villa Monsy I is only a few minutes' drive from the beachfront and facilities of this popular resort. Both Pollensa Old Town and the seaside resort of Alcudia are also within easy reach by car. All 3 resorts have a huge and diverse choice of shops and places to eat. A number of alternative beaches can also be found nearby. Villa Monsy I is semi-detached with Villa Monsy II and Villa Ana is along the same street - ideal for larger parties. The square, or plaza, at Puerto Pollensa (Puerto Pollenca) is host to a lively weekly market selling clothes, jewellery and souvenirs. Pollensa (Pollenca) Old Town also has a weekly market, with a more traditional vibe, selling locally made souvenirs and food. You'll also find a number of beachwear and gift shops along the promenade in Puerto Pollensa. A choice of restaurants can be found within a few minutes' on foot, but the centre and seafront, Pine Walk and marina of Puerto Pollensa have a much larger choice of stylish and contemporary cafes and restaurants. Pollensa Old Town has a much more traditional ambience, with a selection of Spanish tapas bars and quaint cafes along its cobbled streets. The nearest beach is the large sandy bay of Puerto Pollensa, just under a mile away from Villa Monsy I. The beach has golden sand and clear shallow water, with a number of seafront bistros - ideal for families. If you fancy a change of scenery, the small but charming town of Cala San Vicente is around 4 ½ miles north, where you'll find 4 pleasant coves and 3 sandy beaches. Aside from Puerto Pollensa and Pollensa Old Town, Alcudia is well worth seeing. This friendly resort has a beautiful beach, a fascinating old town and a superb marina, not to mention a huge choice of shops and restaurants for all tastes and budgets. Further afield you can explore Europe's largest underground lake at the Caves of Drach, the hidden beach of Formentor, the views from La Victoria Monastery or a day trip to Palma city! Pollensa's golf course is around 6 miles south, on the other side of the old town. Alcudia also has a golf course on the far side of the marina, around half an hours' drive away. Puerto Pollensa has various water sport facilities and boat hire options by the seafront. You can also enjoy cycling or walking around the area - a great way to see some of the spectacular scenery Majorca (Mallorca) has to offer. Villa Monsy I is not available to book for season as it is sold out. Take a look here at the Majorca villas that are currently on sale.